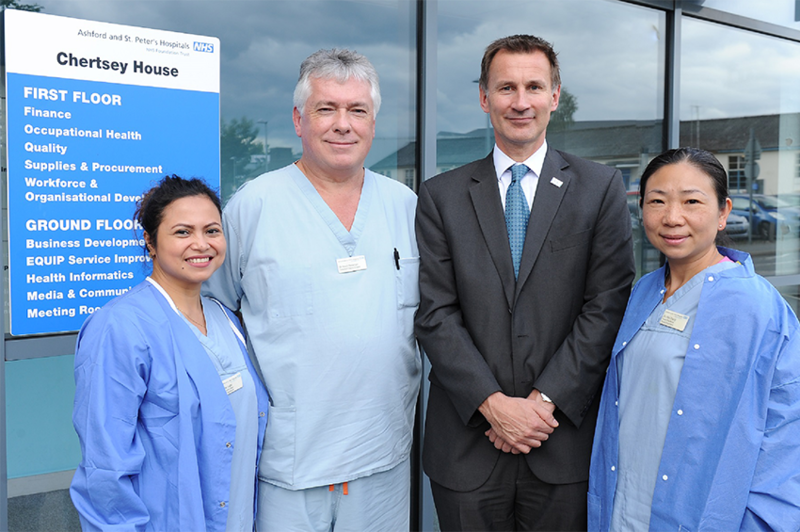 Secretary of State for Health, Jeremy Hunt MP and his Senior Clinical Advisor, Professor Sir Norman Williams visited our Trust on Friday 15th September to discuss patient safety with around 40 members of staff. The event kicked off with a presentation from Trust Medical Director, Dr David Fluck, who described the patient safety journey taken by the Trust. He said: "Since introducing our '4 Ps' - Patients First, Personal Responsibility, Passion for Excellence and Pride in our Team - around eight years ago we've been on a journey to improve patient safety. “We've made some great progress with this and I was pleased to share some examples with Jeremy - including our work to improve the early identification and treatment of sepsis and to reduce the number of hospital-acquired pressure ulcers. However, we are not complacent and know there is always more to do." Jeremy went on to share his own journey, experiences and reflections on patient safety. He described the stories of some patients and their families which had really struck a chord, leading him to make patient safety one of his biggest priorities. He said: "It was a pleasure to meet staff and hear about your patient safety initiatives and drive to embed transparency at the heart of the Trust. I was impressed by the work you are doing to create a culture of openness where staff are supported to speak up, helping to achieve our ambition of making the NHS the safest healthcare system in the world."